Ways with Words presents interpretive essays by scholars from different disciplines on seven core, premodern classical Chinese texts. The remarkable diversity of these works--drawn from literature, philosophy, religion, and art history--challenges the presumption of a monolithic Chinese tradition that has been promoted by scholars and popular culture alike, both in China and the West. The texts themselves include a poem from the Classic of Poetry compiled in the sixth century b.c.e. ; passages from Mencius and Zhuangzi; the Heart Sutra; a poem by Du Fu and the Biography of Yingying by Yuan Zhen, both written during the Tang dynasty; and Notes on the Method for the Brush, a tenth-century text attributed to Jing Hao. 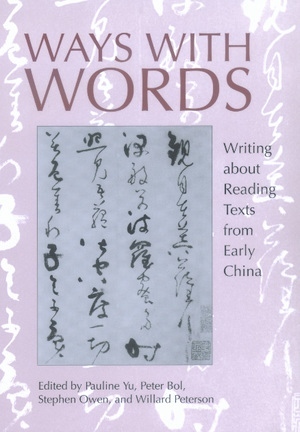 Both the original Chinese versions and the translations are provided for each primary text. There are at least two essays--when possible from scholars in different fields--on each work. The volume as a whole demonstrates the various ways in which the modern Western reader can confront the impressive variety of texts from the classical Chinese tradition. Pauline Yu is Dean of Humanities and Professor of Chinese Literature at the University of California, Los Angeles. Peter Bol is Professor of East Asian Languages and Civilizations at Harvard University. Stephen Owen is James Bryant Conant University Professor at Harvard University. Willard Peterson is Professor of East Asian Studies at Princeton University.